Not every culture celebrates Christmas, but every culture has at some time or another recognized the mysterious power of the winter solstice, the day on which the sun begins its slow return. I love Flickr, which I regard as clear proof that our ordinary lives are anything but. I love photographs precisely because they halt the flow of time to reveal this. To celebrate the generosity of Flickr photographers who share their work, I have begun putting together groups of photographs called "Pictures from the Earth." This is one such grouping. 1. Nature's christmas trees is by KitAy (Pennsylvania Paddlefish). Is this not moving and evocative? There's something so bygone and yet familiar about it: all the reds and silvers and whites. To me it captures not only the beauty of the winter holidays, but also the sadness that surrounds them. It's the time of year when you're most aware of the passage of time, and particularly of everything in your life that's gone. I don't know why, but there's something about that sort of sadness that's very close to joy for me. 2. 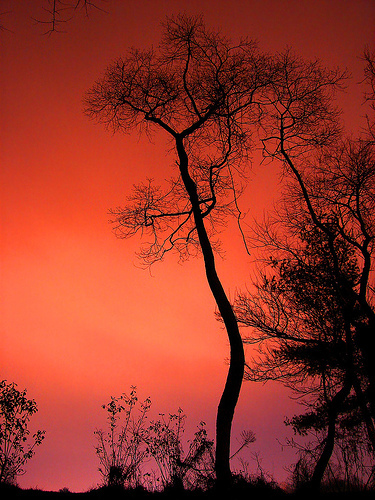 Winter sky and tree by Blueleaf/Alexander Saggers. This is the view from outside one of his windows. I thought the clarity, brilliance of color, and minimalism of this was a lovely contrast to the previous one. 3. Airy Fairy by Ross Finnie/Twentyhertz (twentyhertzphoto.co.uk), bass player and Glasgow photographer. 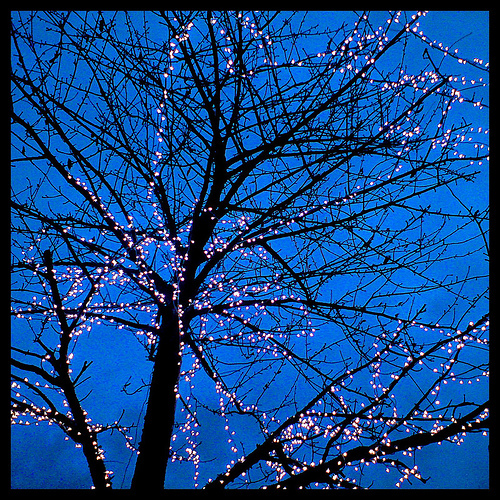 These are "fairy lights"---for you Americans, that's British for little white lights--- on a tree outside Glasgow. I love this because it shows such eerie delicacy and detail coming out of someone's rather random job of stringing up lights (fair play, it would be difficult to do it at all). 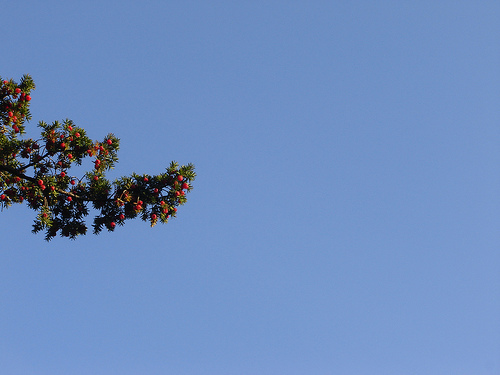 The blue-green of the sky is something amazing. 4. 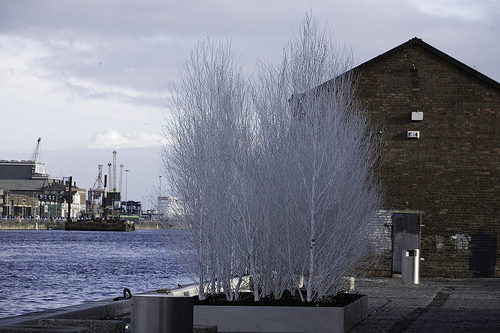 Christmas trees in Dublin Docklands by William Murphy/Informatique. Notice the white-painted trees and the contrast between their delicacy and the rough texture of the building behind them? You can see why I say that you won't want to miss his "Streets of Dublin" project. I love this because it illustrates how many shades of grey and silver there are in the world and how beautiful they can be. 5. Christmas Tree by Matt Reinbold (Furry Scaly) takes some amazing photos, including some photos of amazing animals. He has also taken a several pictures at different times and different times of the year of this same tree. This one is his Christmas version. I love it because this is a perfect reflection of my idea of a winter sunset. The intense vermilion-tinted sky reminds me of the days when I didn't live in Florida (where the colors tend to be apricots and heavenly blues, not this brilliant but clear fiery peach red). I do not own the rights to this photograph. It is printed here with the permission of the photographer. Please don't save or use it without first asking. 6. 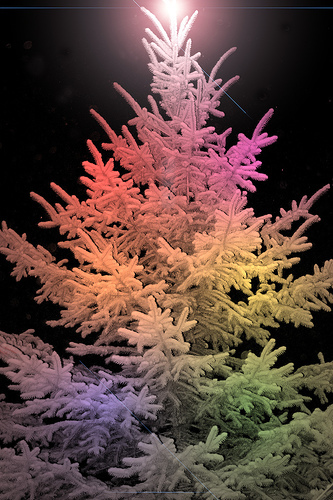 Christmas tree by Perfect Hexagon/Steven Janke. This photograph is seasonal in a different way and illustrates the serendipity behind a really great photograph. Here's the photographer's comment: "The sun was set perfectly on the tree... My focus was perspective. 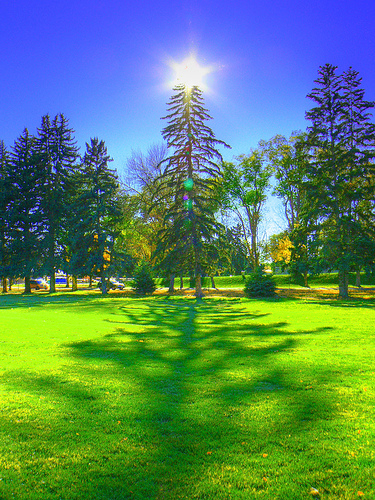 My intention was portraying the comparison of the shadow to the tree, however the sun added a nice effect to the whole picture." I also noticed the green lights or orbs in the photograph which add an additional Christmassy touch. 7. 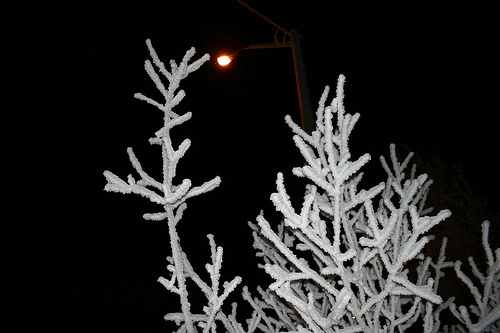 For a very complete contrast, check out Frosted Trees by Mac Male/MasterMaq of Edmonton, Canada (check out his blog). This next captures extremely well the ghostly, stark and shivery cold beauty of ice-encrusted trees against a black sky. It's beautiful, but it makes you shiver. It brings to mind stories I used to read as a child about the "northern climes." Most clearly, it brings to mind "The Snow Queen" (which I found in one of the books my grandfather had read as a child). I put it in the center of my T13 because that's where the winter solstice is in my mind. This really captures the feeling of the winter solstice. Even the orangeish light works as a reminder that the deepest part of winter is the day the sun begins to return. 7-8. 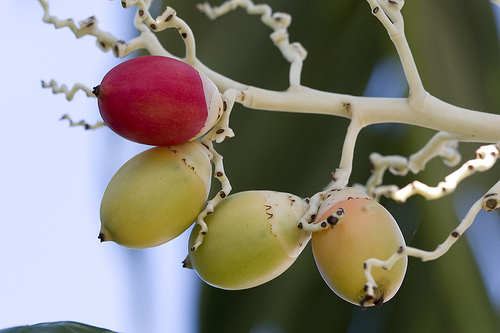 Christmas Palm. First, for a touch of color to contrast with deeps of winter, consider these two "before and after" shots by Graham/Gragsie. He lives at Big Pine Key in my own beloved state, Florida. You'll want to check out his personal site. I do not own the rights to these Creative Commons photographs. Please don't save or use them without first consulting the terms of the applicable license (here and here). 9-10. 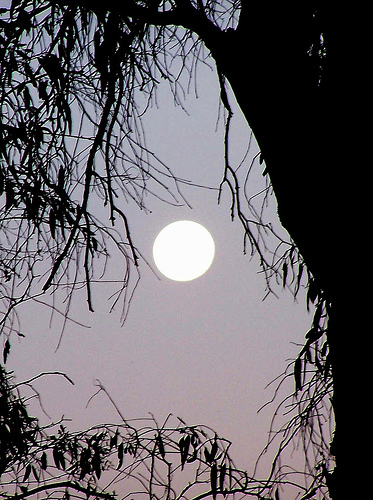 Moon & Trees by Quarrion/David Stephensen of Bendigo, Australia. 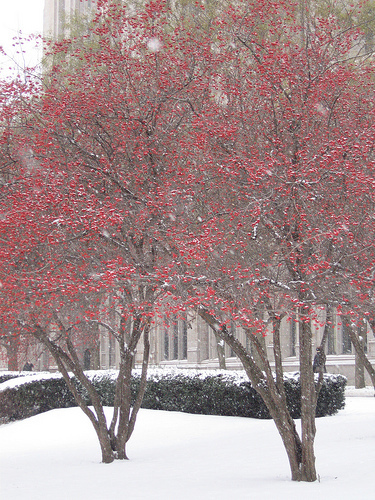 These two winter photographs remind me of Japanese paintings. Both are examples of photographs that happened because the photographer just happened to be in the right place at the right moment. New Moon at Ravenswood . The color of the sky---that silvery grey with intimations of blue-violet---really grabbed me first. 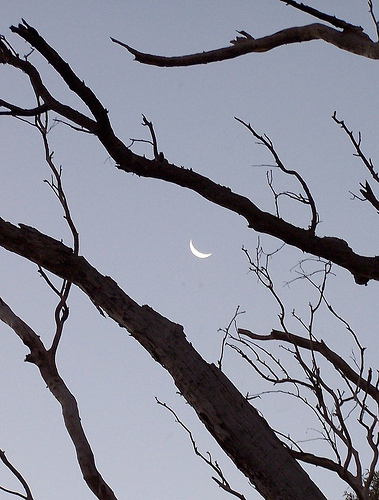 But it was the crescent moon through the tree limbs that sold me. Nine days later... I loved the first but this I adore. Note that the color of the sky here really is a silvery blue-violet instead of a silver with a touch of violet. This is one of my favorite colors on the planet. It doesn't have a name, but it should. 11. Palm by NYC Bone/Dave Bone (check out Bone Structure here). 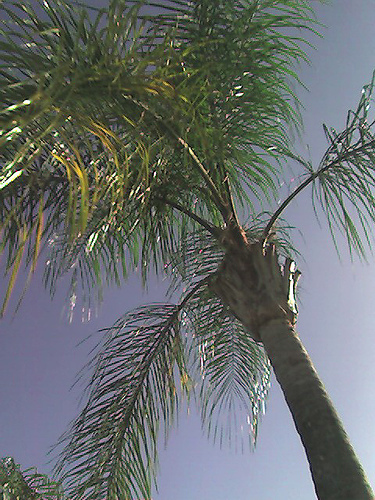 As a Floridian, I truly love palm trees and photographing palm trees. They have a reflective surface that picks up and gives back the light---a forest of palms under a sunny sky is blinding. It actually twinkles in the sunlight. This next is the winter photograph I've personally been trying to take for years. 12. 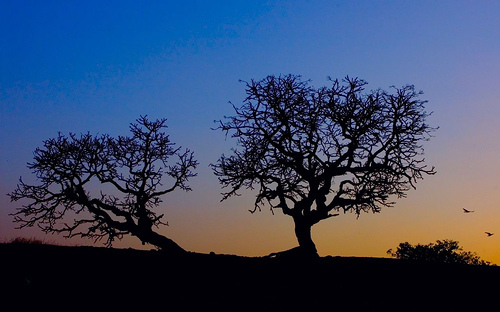 Winter trees on a hill by Ramesh Meda of Bangalore (website). Look at that sky. Look at the way it shades imperceptibly from deep blue to that silvery blue violet to apricot. The trees are like lace. 13. Christmas Tree by MPHDodgeDaytona. This last seemed to me to be a beautiful finish. I think it speaks for itself. The Flatland Almanack is grateful for comments from the authors of the following blogs! I could stare at each picture for long minutes, each of them is beautiful beyond words. You did a wonderful job , it was a pleasure to stop by, thanks! and happy thirteening! You should have put them for Wordless Wednesday ! They are so beautiful it leaves you without words ! If you would like, check out 13 Reasons I Should Be Getting a Promotion for Christmas Regardless of my Gender. AWESOME pictures. Thank you for sharing - I enjoyed! Happy Holidays! Wonderful pictures. I love #5! A wonderful TT as usual! I like #5 best. These are all so beautiful! Happy Solstice. Lovely additions to Thursday 13! Oh, these are beautiful! I can't even pick a favorite--they're a wonderfully evocative. These are really spectacular. Thanks for posting them and calling attention to some wonderful photographic art. Beautiful! Each and every one :) Happy TT, and Happy Holidays! Flickr is one of my favorite sites and these photos are spectacular. Nos. 6 and 13 are extremely creative. Such beautiful pictures. I love No. 6. Great thirteen! I love #6. They are all beautiful, though. Happy tt and Merry Christmas! Just beautiful! You did save the best for last. Very lovely, and such diversity. Creation is amazing in all its various forms, and I never tire of discovering its beauty! Thanks for visiting Miller Manor--come back anytime for a visit! Those are beautiful photos! Happy TT. WOW, what beautiful photographs. Thank you for sharing them with all of us. 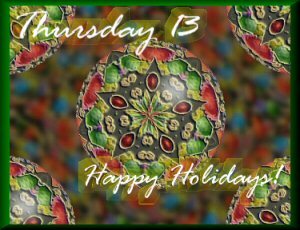 Have a wonderful Christmas and thanks for stopping by my T13. Wonderful photos! :) Happy TT! Trees and moons. Very seasonally moody. Thanks for sharing these stunning photos. 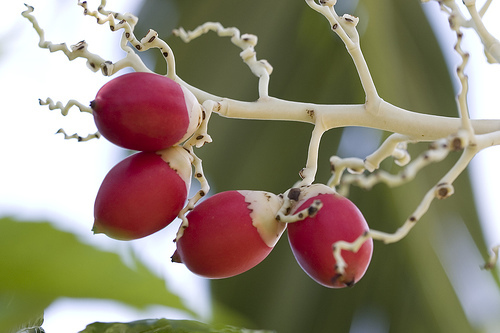 My personal favorites are the Christmas Palm and Nature's Christmas Tree.